From Aurel Stein, Eugen Hultzsch, John Marshal, Alfred Stratton to George Grierson, all of them were helped in their studies of Kashmir by a man in Srinagar named Pandit Mukund Ram Shastri. In early 1900s, 23 of the 29 books of “Kashmir Series of Texts and Studies” were brought out by Research Department of Jammu and Kashmir under his editorship. Books that are still read and shared in academic circles. And yet, if you Google Image Search, you will find no photograph of Mukund Ram Shastri. You can easily find Stein, Hultzsch, Marshal, Stratton and George Grierson, but no Mukund Ram Shastri. 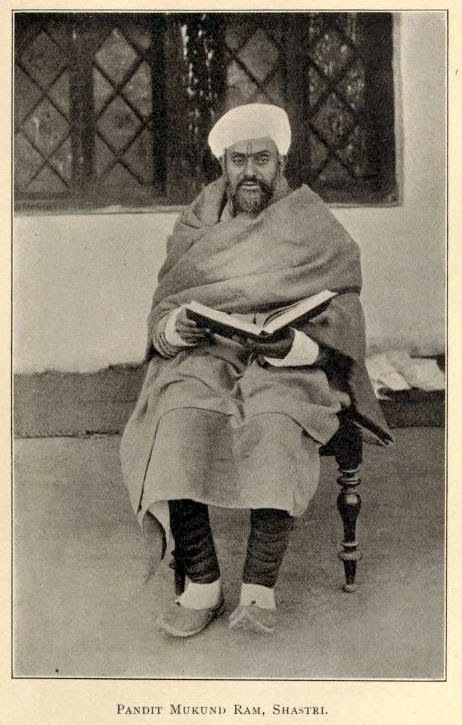 Given here is a photograph of Mahamahopadhyaya Pandit Mukund Ram Shastri, found in the biography of Stratton, ‘Letters from India, by Alfred William Stratton, with a memoir by his wife Anna Booth Stratton and an introductory note by Professor Bloomfield’ (1908). (This post is reproduced from Search Kashmir with due permission from its owner). Previous Previous post: Prof Raffaele Torella (Roma) with Pandit Dinanath Yacch (Srinagar).